ADHD or Attention deficit hyperactive disorder is a common behavioral disorder mostly seen in children, but might even persist up to adulthood . Though not a learning disability, about 50% of kids with this condition are found to have difficulties with their social and learning skills . Characterized by hyperactivity, impulsiveness, and inattention, children with ADHD face problems in their emotional, academic and social arenas. Parenting kids with ADHD is indeed a challenging task as a lot of time goes into comprehending their unusual behavior which is a result of the different mechanism of their brain as shown through studies . Here are certain useful tips for parents to follow while dealing with their children. Chalk out his daily routine on a chart paper and place it in his study. Stick a smiley after every completed task to boost his morale. Keep all his belongings in a fixed place so that he has fewer chances of losing them. Divide his homework into smaller parts with coloring and puzzle solving sessions in between to avoid monotony . Make story time a ritual where your child can interact with you and pour his heart about everything running through his mind. Help your child understand the difference between good and bad behavior by praising him for his positive actions, and disapproving the unacceptable traits. For improper or aggressive behavior, do not shout or beat the child, rather make him realize his mistake by trying the time-out method where he is confined in a limited space, unable to communicate with anyone or engage in any activity. The span for this activity is 2 to 5 minutes for 2- to 5-year-olds; 5 minutes for 6- to 8-year-olds; 10 minutes for 8- to 10-year-olds; 10 to 20 minutes for 10- to 14-year-olds [2, 3]. Electronic gadgets like television, video games and computers should be restricted as they often lead to inattention and destructive behavior . Besides fixing a proper sleep pattern, remove caffeine and sugar from their diet as they tend to come in the way of a sound sleep . Create a white noise at bedtime by putting the radio on static mode or turning on the fan . Reduce his activity levels one hour before bedtime, limiting to things that may relax his mind like reading or coloring . Massage your child with essential oils like lavender or sandalwood or add them to a diffuser to spread the aroma in his room to help him remain calm . To overcome his difficulty in interacting with peers, work on his social skills. Consider bringing his friends home (one or two at a time) and observe them interact. Intervene right away if you find them behaving roughly . Because of his inability of expressing himself well, he may lose out on friends. Enroll him in any activity class he is interested in so that he may gradually learn to function in a group . If your child is always teased and bullied in school, look into the matter immediately. Know what is going in his mind and suggest alternate ways to handle such things in future. You can also role play the situation to explain what you would have done if you were in his place [8,9]. Take your child to parks or playgrounds having a lot of greenery, as research says that spending quality time in the lap of nature is beneficial for kids with ADHD . Introduce interactive toys or games that would foster cognitive and motor development. 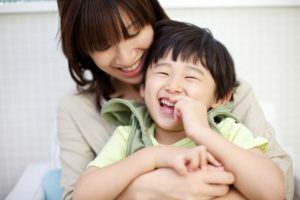 Besides training and guiding your child, there are a few other parenting strategies that you should keep in mind to succeed in your endeavor. Never rebuke him on his weakness, rather make him feel you are there for him always . Shower him with hugs and cuddles whenever he is at his best and also at bedtime . Though you may often hear about his slow development in school, do not lose hope or get demotivated . Keep believing in him. Instead of keeping big hopes, rejoice every small goal achieved by him. Understand your child well and try channelizing his areas of strength in a productive way. Do not be over-dependent on medicines. For example, if your son displays hyperactive behavior, correct him instantly instead of asking if he has taken his medicines or not . Be consistent with the dos and dont’s you set, like if you are scolding him for throwing a tantrum at one time, do not let him go the next time. Your confused behavior would negatively impact him . While training your child to do something, do not leave it midway if you fail to achieve it. Keep trying till you get positive results. Interact with his teachers on a regular basis to keep a track on his development. they should also be informed about anything new happening in your family that may likely affect your kid’s behavior. Keep a record of his reports, copies, and notes. In order to de-stress, take some time out for yourself once in a while and engage in anything that relaxes your mind . Join an online ADHD forum or support group like WebMD ADHD Online Community or CHADD Forum for a more comprehensive parental guide. Attend parenting classes, seminars or even hold discussions with other parents to widen your outlook in coping with your child . ADHD or Attention deficit hyperactive disorder is seen in many children these days, this blog would help the parents to handle it in the best way. The video you have posted in the blog provides very good information on handling ADHD children. Thanks for the post !!! I like the suggestion of regulating your child’s sleep pattern to help with their ADHD. I just found out that my son has ADHD and we are learning how to work with him. Thank you for the tips on parenting a child with this attention deficit.